We believe that 25 million Australians are better off when the 8.8 million Australians who live outside of the metropolitan cities are creative, productive and thriving, contributing their unique perspectives to the national identity and making Australia a more culturally diverse nation. Increasing funding to the RAF will enable more support, better outcomes and stronger communities across Australia. The RAF is an extensive national program, funded by the Australian Government and is one of the most successful funding programs supporting arts and culture in Australia. Between 2012 and 2016 the Regional Arts Fund supported 1,458 projects; 3,979,899 participants; 843 professional development opportunities; 1,943 artists and arts workers and 3,015 partnerships. Regional Arts Australia is calling for an increase of at least $2 million per year to the Regional Arts Fund. This will restore the RAF to its pre-2010 value by lifting the total value of the fund to $22.5 million over four years, beginning in July 2020. Want to know more? Have a read of our blog post here. We need your support. We need you to energise your communities and let our elected representatives know that regional arts matter and that the RAF deserves to be increased. Contact the Minister for the Arts, Shadow Minister for the Arts and your local member and let them know that regional arts matter and that the RAF deserves to be increased. You can download template letters below (and we encourage you to personalise these). We need your support to better support regional, remote and rural arts. 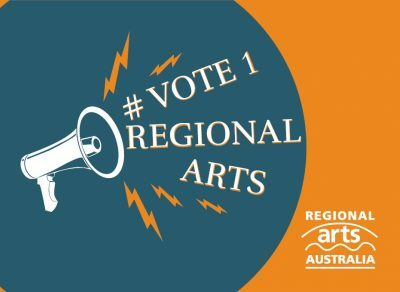 In the lead up to the upcoming federal election, let our politicians know that regional arts matters.